$300 Off First Month’s Rent! Offer expires April 30th 2019! Tucked away at the west end of 8th street, sits Trolley Park Lofts; a seven story industrial, red brick building located on the corner of West 8th and Bank Street. Trolley Park Lofts features elegant one and two bedroom floor plans for rent with heavy timber ceilings, colorful brick walls and stunning views. 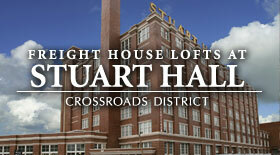 Loft interior features include stainless steel appliances, walk-in closets, plank flooring and Google Fiber. The picturesque Garment Place Park is stationed right in front of the Lofts adds human-scale neighborhood characteristics to this otherwise urban environment. 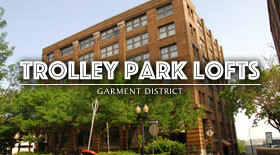 Trolley Park Lofts building amenities have a fitness room, storage and Club Room where guests can be entertained. Resident parking is also available and courtesy patrol monitors the property on a regular basis. Trolley Park Lofts were erected in 1907 and designed in the Industrial/Neo-Classical Revival style by prominent Kansas City architects, Shepard & Farrar, for the use of the Noyes/Norman Shoe Company of St. Joseph, where they manufactured and stored shoes. Since then, the ground story windows were modernized, however, the rest of the structure has remained original. This building, much like the rest of the Wholesale/Garment District, was used for textile and clothing industry giants whose products dominated markets during the early twentieth century. 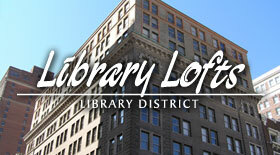 Due to its convenient Downtown location, Trolley Park Lofts has numerous options for bars, restaurants, cafes and other attractions and destinations including the Garment District Museum and the Kansas City Public Library within short walking distances. The popular River Market area is available just to the northeast for a few blocks. There, you will find fresh produce, vibrant shops featuring odds and ends and numerous restaurants of different cultural fares as just some of the ingredients in this vibrant district. 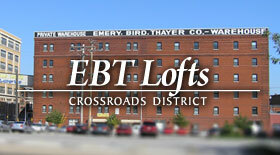 Furthermore, the Lofts are located two blocks from Broadway Boulevard, a major arterial that goes south to Midtown and the Plaza District. Bus and streetcar stations are located just to the east and designated bicycle routes are in close proximity. Trolley Park Lofts enjoys a B-Cycle station located right in front of the building and bikes can be rented to cruise around Downtown anytime you wish! Trolley Park Lofts are ideal for city dwellers looking for cozy, comfortable and affordable in an area rich with history and convenient features. Health Club – Residents have access to a fitness facilities with a full range of cardio, strength training machines and a sauna. Parking – Gated and covered parking available. Interior Design – Stainless steel appliances, lofted wood beam ceilings, walk-in closets, exposed brick interiors and large windows with incredible views. Security – Keyless entry systems offer convenience and security complemented by a courtesy patrol service that provides onsite security services.